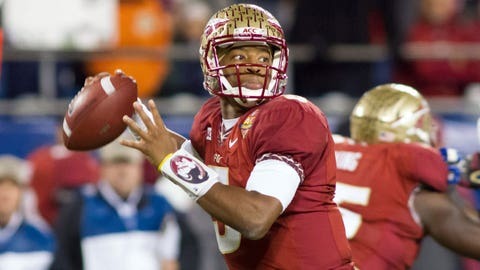 Heisman Trophy winner Jameis Winston was selected to the freshman All-America team by the Football Writers Association of America. Florida State quarterback Jameis Winston highlights the freshman All-America team that has been released by the Football Writers Association of America. Joining the Heisman Trophy winner on offense is Pittsburgh receiver Tyler Boyd, Arkansas running back Alex Collins and his Razorbacks teammate, tight end Hunter Henry. The defense features Ohio State defensive end Joey Bosa, UCLA linebacker Myles Jack and Florida State defensive back Jalen Ramsey. Auburn was represented by offensive lineman Alex Kozan. UCLA also put offensive lineman Alex Redmond on the team. The entire team can be found here.